Tyler Smith, an avid cyclist and employee at Human Motor Works has been a part of our athletic team, Team NeighborLink for the past few years. NeighborLink created Team NeighborLink almost seven years ago as a way to engaged our existing community and attract local athletes that would be interested in wearing our gear in an effort to raise awareness and funds for our organization. Over the past few years, Team NeighborLink has grown to over 100 cyclists, triathletes, dozens of runners, CrossFit enthusiasts, and many other sports. Athletes compete in mini-marathons, full marathons, Ironman distance triathlons, CrossFit Games Regionals, 100mi MTB races, cyclocross, and dozens of other events throughout the year. Athletes take our gear all over the United States to compete. While many of our supporters simply wear our athletic gear as a way to align with our mission and raise awareness for us, some take the next step and attempt to raise money on our behalf. After a couple of years of just participating in our events and wearing our gear, Tyler decided he wanted to do a fundraiser for us. Tyler wanted to come up with a cycling event designed to challenge his friends to tackle a new riding distance as well as get more engaged in Team NeighborLink through donating. This past July, Tyler and his wife, Stacey, organized, "Loop The Fort," which was a 100mi bike ride around the City of Fort Wayne. Tyler thought he'd just get 8-10 people join him and raise a few hundred dollars, but he ended up getting over 30 people join him and they raised over $1,500. 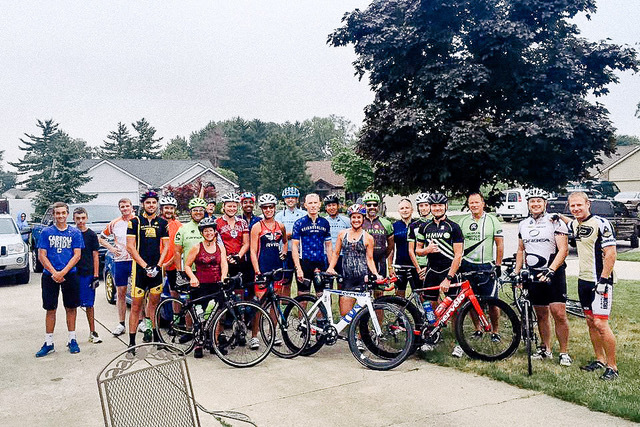 Tyler organized an incredible route that included a little rain, all the terrain of Allen County, and a wonderful post-race meal at his house for everyone that came. It's was a brilliant example of how someone can activate their community of friends to have fun and do good at the same time. Who knew a cookout and a bike ride could be an effective tool to impact neighbors in need. Not only did Tyler want to raise funds for NeighborLink, he wanted to activate that community to actually get involved in a project. So, our staff helped Tyler find a project and organize the resources needed to accomplish it. They ended up helping a homeowner get their siding repaired and their house painted on a Sunday in September. The team responded by volunteering and painting an entire house in a day. Proof that anything can be accomplished if you simply set the goal to do so. Team NeighborLink is a vibrant community of amateur athletes that want to do incorporate doing good and a greater purpose than just working out to accomplish a physical feat. Click here to learn more about Team NeighborLink and how you could potentially get involve. Team NeighborLink athletes raise over $15,000 a year to help with projects.